Uses: Airport, Other Markets Lengths: 7 panel 13'-1" Heights: 6'-0"
When our sales team was traveling through the Orlando aviation terminal we were proud to see our product in use. 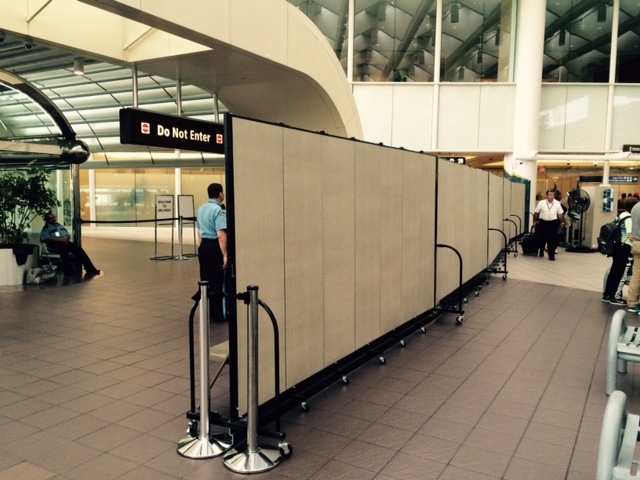 The airport had closed off a section of their terminal from passengers use and used Screenflex Room Dividers to deter guests from entering the terminal. The agents remarked how pleased they were with how easy it is to move the room dividers into place. With the purchase of multi-unit connectors, the room dividers are locked together to form a longer wall, which is needed in this large space. Screenflex Portable Room Dividers are available in 38 Colors and 6 lengths and 6 heights.